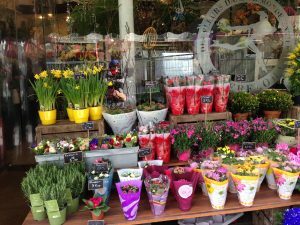 Wednesday, March 21: the sun actually came out so I wandered around the streets of Paris and marvelled at the flower displays outside shops. 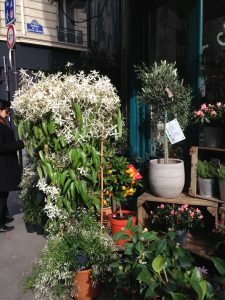 It was as if every owner of every flower shop in Paris suddenly decided winter was over, enough was enough, and hauled out every single plant to put on the sidewalk. In one place I smelled the flower before actually seeing it: the scent of jasmin was so overpowering I thought I’d faint. All this gave me the feeling that spring might actually come…. 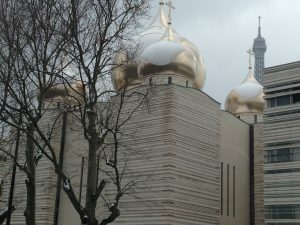 But it’s all so strange – my first photo, snapped from the car on my way to my book club at the American Library in the 7th, is of the “bulbs” of the Russian Cathedral (also known as the “Holy Trinity Cathedral and The Russian Orthodox Spiritual and Cultural Center”) decorated in snow. Then only a couple of days later the snow melted, the temperatures rose slightly, and the flower vendors displayed their beautiful wares – as only the French can do with such artistry – out in the streets in front of their shops. Go figure! By the way, the book we discussed at the American Library was “The Age of Innocence” by Edith Wharton. If you want to learn about social strictures and the way it was in New York “society” pre World War I, this is an excellent start. When Wharton lived in Paris, it was in the oh so respectable 7th arrondissement. One can hardly imagine her anywhere else. As for me, I’m all over Paris. My joy is constant discovery – and I’m happy to invite you, dear reader, to come along with me. A bientôt! This entry was posted in Uncategorized on March 22, 2018 by harriet.welty.